Bethany Congregational Church in Greenland, New Hampshire, is a bible-teaching church within the state’s seacoast region holding close to 800 people, which is large for northern New England. To expand our reach into the community with another location, Bethany found an ideal companion site in Raymond, New Hampshire, a rural area approximately 20 miles away. Providing a sense of oneness between the two locales was paramount. Our challenge was to bind the two campuses by transmitting the sermon from one location to the other using video technology so that worshippers would receive the same message. The question was, how would the Raymond location, which holds no more than 200 worshippers, respond to watching a sermon delivered on a screen? I believe technology should provide a distraction-free environment and rich experience that allows people to have a close relationship with God. If we get in the way of that by being too clever for clever’s sake, then we are pulling people away. It is important to always remember that we are a church, not a video production house. We had been working with Robert Haigh of Access A/V, our local resource for video production. Access A/V sells several brands of integrated switchers, but Robert thought NewTek’s TriCaster was the best fit for Bethany’s multi-level needs, including sending the live HD signal to a satellite church 20-some miles away, live on a stream, recording for television, on monitors throughout the Greenland campus to various rooms such as the Fellowship Hall, and podcasts. So what made us select TriCaster for this important mission? We knew this was going to be a transitional period for us. We had legacy SD equipment at Greenland but were trying to get the Raymond campus off the ground in HD. I needed a switcher that would allow me to be in both spaces and let me transition over a period of time. We needed technology that we could grow into, and not be limited in terms of content production. I needed to bridge this over a few years as we could afford to make the changeover. 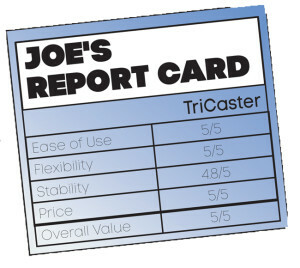 I needed flexibility, and the TriCaster offered that. But the fact that the TriCaster could handle any variation of SD and HD, in any format, caught my attention immediately. We are a 720p house, but not all our cameras are 720p. 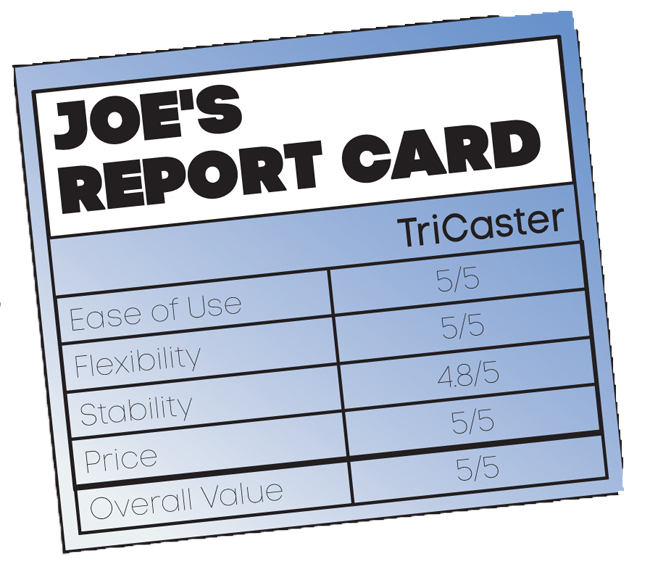 The TriCaster will automatically up-res or down-res the content for us, all by having it connected and configured in the software, whereas with other solutions, you have to buy specific cards: If you have an SD camera, you need an SD card, and so forth. TriCaster 860 allows us to connect many sources regardless of format into a switcher that continues to grow as we grow. Also, TriCaster has an HD, live text graphics package built in, audio in/out, streaming and coding built in, record capabilities of multiple instances of the same or different sources simultaneously (ISO recording), auxiliary output to record and stream something independently. There is an audio mixer onboard, there are mix/effects, virtual set capability…the list goes on. The TriCaster interface is intuitive and easy to work with. All switchers have a learning curve, but the TriCaster is not difficult to learn. And, Robert is just a phone call away to help. In fact, Robert has gone above and beyond the job, joining the congregation, and once a month he runs the TriCaster, using the opportunity to also offer tips and suggestions to the volunteers! Each of the eight inputs on TriCaster supports multiple inputs, and just by setting some software parameters, I can switch from my Sunday setup to my Wednesday setup. I am not rewiring anything, I am just saying, “Use this input now.” The fact that I can have all this stuff plugged into the back of this unit allows me to have this phenomenal infrastructure with TriCaster at the hub of this entire web. Maybe I am only using these elements now, and those elements later, but I can set them all up and not have to do it repeatedly time and time again. The last thing I want to be doing is wiring and rewiring every time I need to do something. I am a software guy. I came from that world. And while I can appreciate a hardware-only solution, with software, I am partnering with a company that has people dedicated to fixing bugs and identifying new opportunities and enhancing the product – and all the customer needs is a software upgrade, not all new equipment. I came from that model and I understand it. While Bethany started out with a TriCaster 855, a software upgrade pack for an additional few thousand dollars transformed the system into an 860. NewTek took a lot of the features that were in its top-of-the-line 8000 model and rolled them down. So for a few thousand dollars, my product now has 20 percent value added to it, and all I had to do was download the software, install it, and test it. I love that about this technology. On a typical Sunday, five cameras are fed into a TriCaster 860: two are JVC cameras on sticks and three are Sony robotic cameras operated by a person in the control room. Song lyrics and graphics are created on an iMac within Renewed Vision’s ProPresenter software and delivered directly to the two SD rear-projection screens in the Greenland sanctuary downstairs and through a network input to the TriCaster, to be used in the video mix. I can bring the graphics into the TriCaster and feed that into one of my channels and layer that on top, or side-by-side, or as full-screen image with the mix/effects function. I can get all these different inputs in various formats and multiple outputs, and set an auxiliary output that will just go to my projection system, which can be different from what you are seeing in the program out. TriCaster gives me that flexibility. We had bought this building and invested in all this technology and wondered how it would go. Then we lit it up that first Sunday and when our pastor said “Good morning,” everyone in Raymond responded with “Good morning” back. So, that answered our question. Joe Sommers has served as the Technical Arts Coordinator at Bethany Church for the past 5 years, and is responsible for identifying, implementing and supporting all Audio/Visual solutions and the training of more than 40 volunteers.